Recently released statistics show that motorcycle fatalities in the state of Maine had reached record highs by early August, with a total of 17 deaths as a result of motorcycle crashes between Jan. 1 and Aug. 3, 2015. Four of those fatalities occurred in the first week of August (with two additional car crash deaths also taking place that weekend). A number of factors have been cited for the increase in such crashes, including an upswing in texting and driving. If you have been injured in an accident due to the negligence of another driver, or if you have lost a loved one, it’s time to contact a knowledgeable Maine motorcycle accident lawyer to understand how to gain compensation for your loss and injuries. At Hardy, Wolf & Downing, we represent victims of car and motorcycle crashes in the Lewiston-Auburn-Bangor areas. We count an avid motorcycle enthusiast, Attorney Chris Lewis, among the lawyers of our firm and want to make sure that motorcycle crash victims, like others, secure just compensation for their injuries. 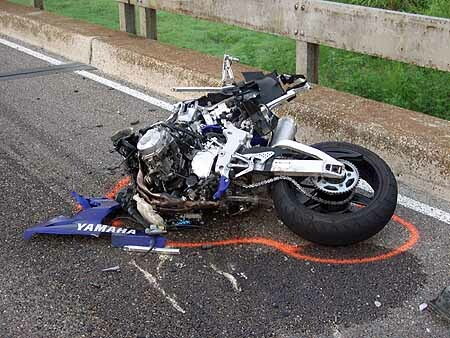 Accounts of the deadly first weekend in August present different scenarios resulting in motorcycle crash fatalities. William “Chris” Tozier, 50, died at about 9 am after his motorcycle struck a deer on Hammett Road in Enfield. Another man from Fort Kent died when his motorcycle collided with that of another cyclist (identities of the two men have not yet been released). A third motorcycle victim, Beth L. Woodmancy, 52, was not wearing a helmet when she struck a utility pole and died. And a fourth man, unidentified, died in a single-vehicle crash on Route 27. While motorcycle registrations have decreased in recent years, fatalities are still on the rise, with 8 fatalities in 2013, 12 in 2012, 7 in 2011, and 11 in 2010. This year’s 17 fatalities represent a record with only half the year gone. The cause of these escalating numbers has been attributed to a number of factors, including speed, alcohol use, and not wearing a helmet. Motorcycle safety expert John Kohler, who coordinates the Motorcycle Safety Program for the Maine Bureau of Motor Vehicles, believes that many crash victims did not have hands on training or safety courses to fall back on. Others see a rise in distracted driving in Maine as a disaster for motorcyclists, who often escape notice when drivers are occupied with their phones. A personal injury lawyer can be of crucial importance as you sort out issues of liability in the wake of a serious or fatal accident. A car crash lawsuit may not make sense in all cases. But for those who have suffered serious injuries or lost a family member due to the negligence of others, it may be the most important step that you take outside of seeking medical treatment. Medical bills, rehabilitation costs, loss of employment or wages, or the disruption of family finances that follow a motorcycle or car crash can be catastrophic for an individual or a family, and personal injury lawsuit may be the primary means for recovering such losses. An attorney from Hardy, Wolf & Downing can investigate your crash to determine whether another driver was culpable for the injuries you suffered. And, if this is the case, we can make sure that you receive maximum compensation for your injuries and losses. Please contact our firm at 1-800-INJURED to set up a free consultation to understand your legal options.